My daughter calls the princess in Pixar’s upcoming film Brave, Brave. Her actual name was a bit of a mystery to us for a while, but the mystery has since been solved but still seems to be hard for her to remember. Merida is the princess and she represents strength and courage and that’s what I’m going to need this next month as I prepare for a month full of adventure. I’m starting off the month getting my passport with my husband. We’re getting passports so we can flee the country. Shhhh, the only reason I can give you is that we’re celebrating our ten year anniversary and we’re getting away to a fabulous hotel in Vancouver Canada. Yep, see how adventurous we are, we’re going about four hours away from our house, if it’s even that far. I’m also going to Seattle this month for BlogHer food for two days. Then I’m going on a wine tasting tour in Eastern Washington staying the night in Leavenworth. I’m pretty excited about that. While I’m doing that Ashley will be staying the night doing a hotel review in Seattle. 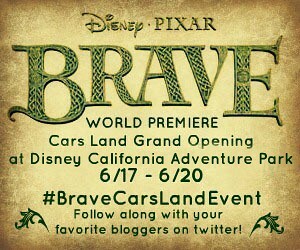 The following week I’ll be in LA for Disney/Pixar’s Brave, DreamWorks Pictures’ People Like Us, a sneak peak of Tim Burton’s Frankenweenie and attending Cars Land at Disneyland’s California Adventure park! I’m pretty excited about visiting Cars Land, I just wish my kids could come because one, they want to go really bad and two, I’m going to see Princess Merida while I’m at the park and Zoe would just adore being able to do that with me. She wants to meet a princess more than anything else I think. Finally, I’ll be heading to Michigan for a trip with Ford as I’ll be checking out the new trends and test driving a police car on a test track. I wonder how fast I can go without freaking myself out. I’m actually afraid to look at my calendar right now because I’m not sure how much down time I’m going to have. We also have a lot of events going on at church that I want to be a part of. I’m wondering if I can just go without sleep. Do you think that’s possible? Happy Early Anniv! Can’t wait till LA! Super Jealous about Ford!